Ratangad fort vests in the beautiful landscape with dense forests on one side and the vast spread Bhandardada lake to the other. It falls in the Ghanachakkar hill range and is the origin point of Pravara river. Ratanwadi is the base village of the fort. There is a beautiful Amruteshwar Shiva temple in the village built in the 9th century in Hemadpanti architectural style. The carvings on black stone of the temple structure bring out the ancient art depicting stories from religious Hindu books like Samudramanthan, idol of Yakshakinnar etc. adjacent the temple there is a beautifully built water tank named as Vishnutirth. There are many corners in it to place idols. While accessing the fort via the ladder route, the flow of Pravara river runs along with us. This route passes through dense forest. 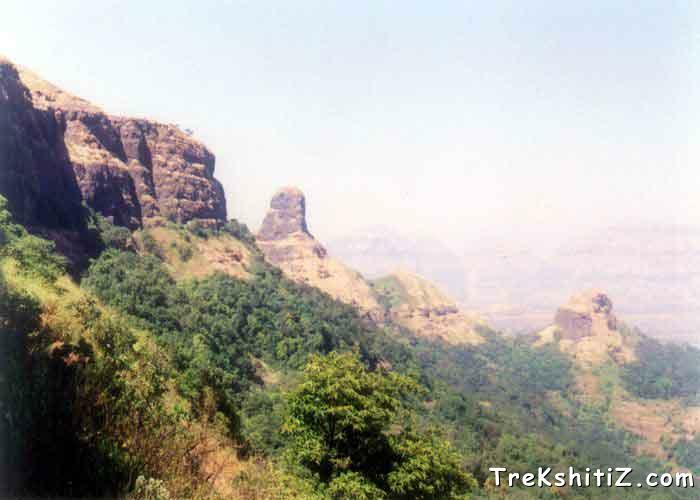 After reaching the second plateau area, the route going to the left goes to Harishchandragad fort while the path in the front goes via the ladder route to the first entrance of the fort. Idol of Lord Ganesh is carved on the door and after we enter the route to the caves is to the right and the left route goes to another doorway. Moving further from the second doorway we come across a round bastion which is now in ruins. There are three water tanks nearby. As we proceed ahead we can spot demolished structures. A 10 minute trail takes us to Konkan doorway which is towards Samrad village. This door is now in ruins. The route which descends form here is uneven and unpaved and thus isn�t safe. Moving further bypassing the door there are two large water tanks. Some people believe there might be an underground secret chamber here. There are many water tanks in a stretch as we move ahead. Further on this route there is a needle eye formed in the hill due to wind. From here Alang, Madan, Kulang, Kalsubai, Ajoba, Harishchandragad, Khutta, Mahuli forts can be seen. To the left on the lower side there is a door which stands in good condition and about 30 to 40 rock cut stairs. This door is carved in rock. The Khutta pinnacle can be seen from this door. On the other side of the needle eye hole is the origin of Pravara river. It takes two hours to visit the entire fort. The base village of Ratanwadi can be accessed by Igatpuri-Ghoti-Shendi route. Small boats are available from Shendi village to reach Ratanwadi in 30 minutes. The first boat departs Shendi at 8 am. Buses are also available from Shendi but it takes a very long route. 1)	Via the cleft between Ratangad and Khutta pinnacle- We come across 50-60 rock cut steps on this route and it takes 2 hours to reach. Route is easy. 2)	Ladder route- This route passes from the left side of the fort. There are two ladders on the way and it takes 2 hours to reach the fort. This is route is easy. The caves near the ladder route can accommodate up to 70-75 people. Available in the tanks throughout the year.